London, Dec. 25 : Coach Rafa Benitez has said that Liverpool''s under performing players are hurt by their current struggles. The Reds have won just four of their last 17 games and were criticised by former striker Ian Rush this week, who claimed not enough of the squad were smarting after last weekend''s abject 2-0 defeat at Portsmouth. London, Nov. 30 : Rafa Benitez hailed Liverpool''s Merseyside derby victory as a turning point. The Reds were outplayed for long periods but clinched it as Javier Mascherano''s effort took a huge deflection off Joseph Yobo and Dirk Kuyt struck late. Boss Benitez said: "We knew a win today could be big for us for the rest of the season. Benitez has been told his job at Liverpool is safe despite the team being knocked out of the Champions League for the first time in five-years. London, Nov 21 : Liverpool manager Rafa Benitez has silenced critics who have claimed that Manchester City can nick the Reds'' place in the top four of the Premier League table. Earlier, a survey of all the 20 Premier League managers, revealed that 80 per cent tipped Manchester City to shatter the league of the consistent top four following their big-spending this season. London, Nov. 17 : Liverpool boss Rafa Benitez has threatened to quit if star striker Fernando Torres bids adieu to the club because of its current financial mess. “It won''t happen. I''d quit. I''m confident it will never happen. If it did, I''d resign,” Benitez said. The cash-strapped club owes a mammoth 245million pounds after the takeover by Tom Hicks and George Gillett. Benitez has been severely criticised for his team’s lacklustre performance both at home and in Europe. 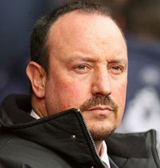 London, Oct 25 : Liverpool manager Rafa Benitez will become a lame duck boss if his club loses to Manchester United. There is no immediate need at Anfield to sack Benitez, but he will be fired if Liverpool miss out on next season’s Champions League. And a fifth defeat from 10 games will make even a top four finish a huge task for Benitez’s beleaguered side. Benitez knows the pressure is mounting, as five straight defeats would represent the club''s worst run since relegation in 1953. London, Oct 23 : Liverpool FC must not panic in their bid to save their season against Manchester United on Sunday, feels coach Rafa Benitez. A home defeat against the league leaders would leave the Kop squad 10 points behind their big rivals and their campaign in tatters by Monday morning, reports The Sun. Moscow, Oct. 21: Manchester United coach Alex Ferguson has warned Rafa Benitez he will have his big guns back to face Liverpool. Wayne Rooney, Patrice Evra, Ryan Giggs and Darren Fletcher missed Manchester United''s trip to Moscow. But if under-pressure Benitez is hoping they will be absentees for this weekend''s Anfield clash, he has another thing coming. London, Oct. 20 : Liverpool coach Rafa Benitez has warned the club’s rivals that he is still in the race for trophies, and therefore, no one should underestimate the team’s potential to hit back. A run of three consecutive defeats, away to Fiorentina, Chelsea and Sunderland, has heaped the pressure on Benítez, who goes into tonight’s Champions League group game at Anfield without the injured Fernando Torres and Albert Riera. 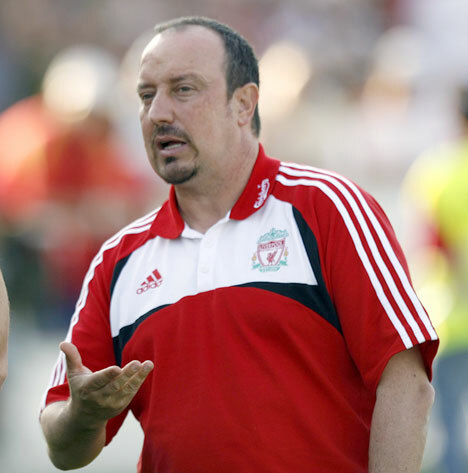 London, Oct. 13 : Liverpool coach Rafa Benitez fears he could become a scapegoat for Alex Ferguson''s referee rant. According to The Sun, Benitez landed a misconduct charge following the opening-game defeat at Spurs, when Phil Dowd turned down a late Reds penalty claim. Benitez is facing a huge fine and possible touchline ban for his criticism of Dowd under the FA''s new code of conduct aimed at protecting referees from verbal attacks. London, Oct. 5 : Liverpool''s Premier League title challenge is not over, said team coach Rafa Benitez in spite of the 2-0 loss to Chelsea at Stamford Bridge. Liverpool have already suffered defeats by Tottenham, Aston Villa and now Chelsea, leaving them six points behind the leaders from the Bridge. But Benitez pointed to Manchester United''s defeat at Burnley and their draw with Sunderland - as well as Chelsea''s loss at Wigan - as reasons to remain cheerful. London, Sep. 28 : Liverpool coach Rafa Benitez has warned Europe that a lethal Fernando Torres is hitting peak fitness at the right time. The Kop''s star Spanish striker blasted a hattrick in 47 minutes against Hull on Saturday. Tomorrow they are in Italy to face Fiorentina, seeking to make it two Champions League wins on the bounce. Then five days later they travel to Stamford Bridge for a battle of the title hopefuls, aiming to repeat last season''s victory over Chelsea, reports The Sun. London, Sep 27 : Rafa Benitez reckons that this season’s Champions League will be tougher than ever for the Premier League clubs. “Barcelona is a very good team and Real Madrid have signed some very good players,” News of the World quoted Benitez, as saying. London - As Liverpool prepare for their first Champions League fixture of the season, manager Rafa Benitez hit out at those who have criticised veteran defender jamie Carragher. Liverpool have begun the season uncertainly, losing to Aston Villa and Tottenham Hotspur - meaning they have already suffered as many league defeats as they did in the whole of last season. Most troubling, they have looked defensively suspect, conceding seven goals in five games, leading to criticism of Carragher. 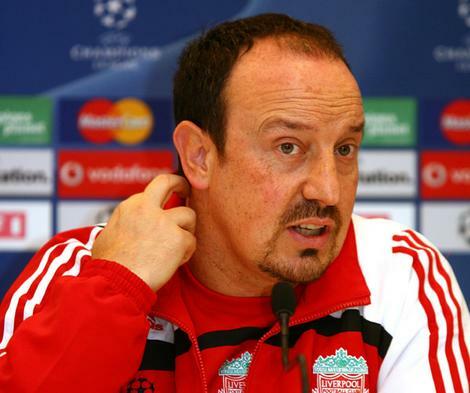 London, Aug 24 : Liverpool manager Rafa Benitez has slammed rumours that he would leave The Reds. Benitez revealed that he was amazed at the rumours and said his phone was flooded with text messages. "They all asked, Are you going? What happened? We had a similar situation when we were in Madrid in February. It was a surprise them as well," The Daily Express quoted Benitez, as saying. The 49-year-old said that he was committed to Anfield and would not be considering any offer in the near future. London, Aug. 19 : Liverpool coach Rafa Benitez has told Spanish hitman Fernando Torres to stop whining and get on with his game. According to The Sun, Rafa told Torres to zip it up after he spent much of the time complaining about the treatment he was getting following Liverpool’s latest defeat on Sunday. London, Aug. 15 : Coach Rafa Benitez has said that splashing the cash on a back-up striker could actually have hit Liverpool''s title dream. The Kop boss has forked out 37-million pounds on Alberto Aquilani and Glen Johnson to replace Real Madrid buys Xabi Alonso and Alvaro Arbeloa. Now, a lack of funds has stopped the club from signing a top-level striker like David Villa. London, Aug 6 : Liverpool manager Rafa Benitez has filled Real Madrid midfielder Xabi Alonso''s boots with a 20 million pound swoop for Roma midfielder Alberto Aquilani. The Liverpool chief agreed on a deal for Alberto within hours of Alonso passing the medical test, which sealed his 30 million pound switch to Real Madrid. London, July 25 : Liverpool boss Rafa Benitez has welcomed back skipper Steven Gerrard after he was acquitted in a night club brawl. Just hours after his clearance on Friday, Gerrard scored a trademark goal for a Reds XI in a 2-2 draw at Tranmere. 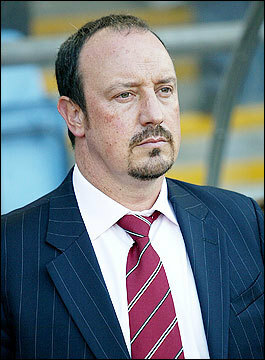 The Sun quoted Kop boss Rafa, as saying: "We are really pleased. He is very important for us and he can now focus just on football. London, May 18: Liverpool boss Rafa Benitez refused to congratulate Manchester United coach Sir Alex Ferguson on winning the English Premier League. The angry Liverpool boss could not even bear to mention Ferguson's name when quizzed about Manchester United's achievement in drawing level with the Reds on 18 titles.